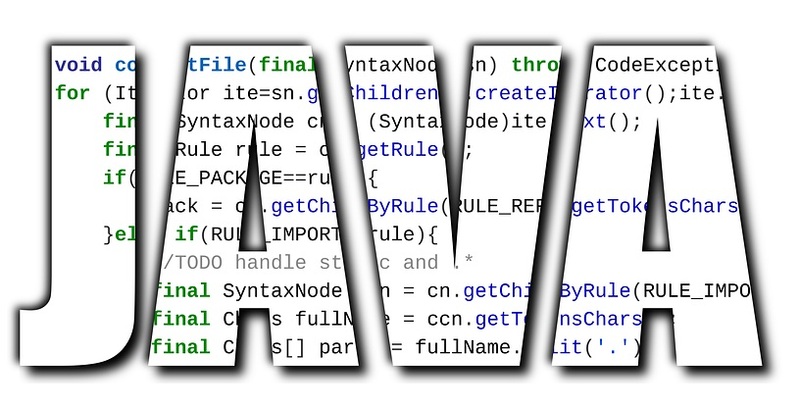 Java is a high level, a general purpose programming language that helps to develop robust, secure, enterprise-level applications. Moreover, it supports object-oriented programming, provides platform independence and many other advantages. 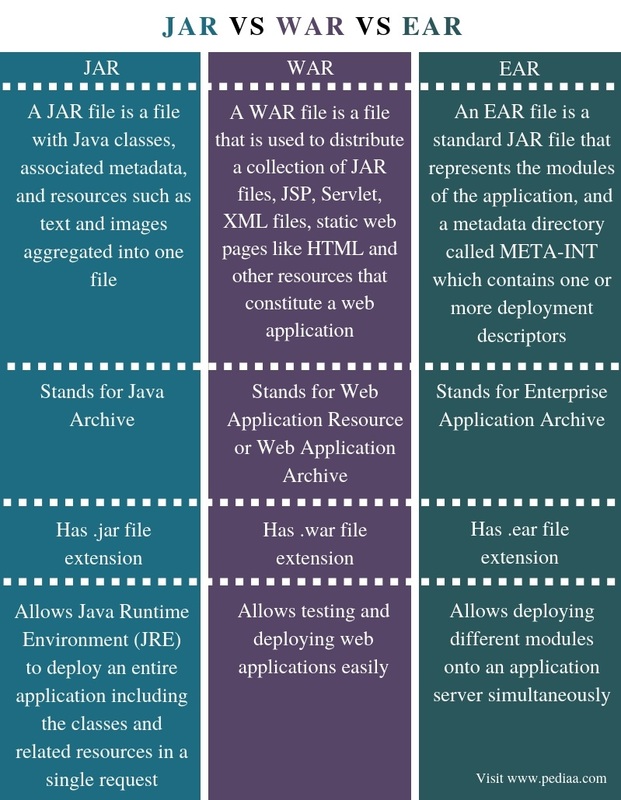 JAR, WAR, and EAR are three files that associate with Java application development. A JAR file has all the components required to make a self-contained executable Java application. It consists of Java source codes, XML based configuration data, manifest file, JSON based data files, etc. In other words, a JAR file is a combination of all these files as a single compressed file. The compressed file reduces the size of the application. It is also easier to send that file through the network to various systems or platforms. To develop Java-based applications, the programmer should install Java Development Kit (JDK) into the machine. Each JDK has JAR utility to support JAR files. It allows creating new JAR files with a manifest file and extracting all the content of a JAR file onto the file system. Furthermore, this utility is also helpful for updating the existing JAR files. It is possible to deploy a WAR file by using the server control panel. Another method is by manually locating a WAR file in a specific folder of the server. In order to deploy a WAR file in a server such as Tomcat manually, the programmer can go to the webapps directory of Tomcat and paste the WAR file in that directory. Otherwise, the server extracts the WAR file internally, when executing the web project. Java EE stands for Java Enterprise Edition. It is an extended version of Java Standard Edition (Java SE) with additional features to develop enterprise level applications. An EAR file is a Java EE file. It packs one or more modules into one archive. Also, this helps to deploy various modules onto an application server simultaneously and coherently. EAR file consists of deployment descriptors that describe how to deploy the modules. These deployment descriptors are XML files. Moreover, applications such as Ant, Maven, and, Gradle help to build EAR files. A JAR file is a file with Java classes, associated metadata, and resources such as text and images aggregated into one file. A WAR file is a file that is used to distribute a collection of JAR files, JSP, Servlet, XML files, static web pages like HTML and other resources that constitute a web application. An EAR file is a standard JAR file that represents the modules of the application, and a metadata directory called META-INT which contains one or more deployment descriptors. Thus, this is the main difference between JAR WAR and EAR files. JAR file stands for Java Archive while WAR file stands for Web Application Resource or Web Application Archive, and EAR stands for Enterprise Application Archive. Another difference between JAR WAR and EAR files is that a JAR file has the .jar file extension while a WAR file has the .war file extension, and an EAR file has the .ear file extension. JAR file allows Java Runtime Environment (JRE) to deploy an entire application including the classes and related resources in a single request. WAR file allows testing and deploying web applications easily while EAR file allows deploying different modules onto an application server simultaneously. Hence, this is another difference between JAR WAR and EAR files. 1. “JAR (File Format).” Wikipedia, Wikimedia Foundation, 26 Aug. 2018, Available here. 2. “What Is JAR File (Java Archive)? – Definition from WhatIs.com.” TheServerSide.com, Available here. 3. “WAR (File Format).” Wikipedia, Wikimedia Foundation, 13 July 2018, Available here. 4. “EAR (File Format).” Wikipedia, Wikimedia Foundation, 16 Nov. 2018, Available here.